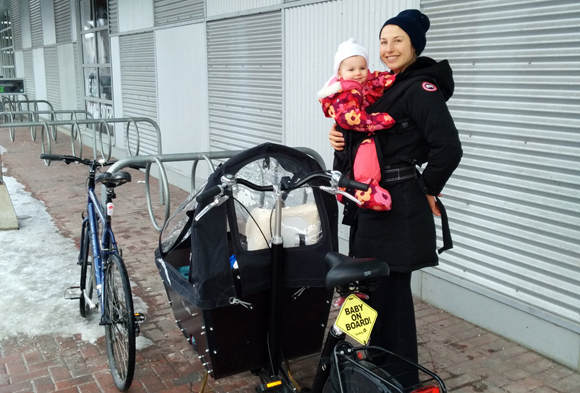 Maayke Schurer and her daughter, Yfke Schurer-Napiorkowski (2), are all-season cyclists. Read on to see what they’ve learned about winter cycling as a family. Photo by Michael Napiorkowski. A few years ago we voluntarily changed our mobility habits to make the bicycle our central transportation choice. As fairly new parents of a toddler (and another on the way), we wanted to adopt a lifestyle that allowed our family to grow without the daily need, cost or burden of automobile ownership or the negative impact this places on others who share our streets. We wanted to be outdoors, active, healthy, connected, feel alive and of course, save money. These are all things the bicycle easily brings into ones’ life. With this choice however, we also needed to be practical and learn how to embrace and love the winter climate in Ottawa with its heavy snow, ice and cold for at least four months of the year. Because Ottawa has almost no winter-maintained bicycle infrastructure, bicycling as a family with young children is especially difficult. However, with some planning, patience, flexibility and a Dutch cargo bicycle we’ve continued to learn how to make it all work. This of course is all propped up by the naturally positive aspects inherent in bicycling that have become the backbone of daily trips filled with joy, adventure, fun and of course cold! There is no perfect way to travel in the winter. Each mode of transportation has positive and negative attributes, whether it’s a car, bus, O-train, bicycle or walking. One thing is for certain: no mode of transportation can beat bicycling for its connection to the community, efficient speed, extremely low cost and enjoyment – even through winter. On snowy days we have the opportunity to stop to have conversations with friends and enjoy being fully immersed in our environment along the way. We get to feel the falling snow, crisp cold air, wind and sun while developing an appreciation for our community. This would all be missed if we were sealed off in a soundproof car or bus. There is also an incredible sense of adventure when embarking on winter trips, especially when travelling with our young daughter who is almost two years old. One can just imagine the excitement felt through the eyes of a toddler when fully connected to the environment and moving at a speed that allows us to take it all in. In our minds, this is comparable to nature exposure but with an urban twist. Kids get to interact with the world around them in a whole new way that has a positive effect on their cognitive development. The diversity of stimuli flooding the senses, with all the smells, sights, tastes and sounds is so much more enriching compared to the sealed off vacuum of a motor vehicle, and as a direct by product we get daily doses of fresh air and exercise. It keeps us healthy, allows us to enjoy each other’s company, and troubleshoot obstacles together – all positive aspects that help build a stronger family unit. In addition to these very positive experiences, there are some practical steps that need to be taken to bicycle through the winter. While travelling with a toddler in the winter keeps most our trips short, we are brought closer to the local business community, which in turn results in support for local shops. This is also why we chose to live in a location close to everything without needing a car. In the winter, our family bicycling distance is reduced to about a 6 km radius and 12 km for work. This is a limitation that we actually appreciate, as it simplifies our life and causes us to care more about areas that have become a part of our daily experience. Not only are most essentials within a shortish distance, but there are a few routes that make it easier and less stressful to get around while sharing road space with motor vehicles in winter. This helps us feel a little more comfortable traveling with our daughter and also makes the trips more enjoyable. It would be much easier – and preferable – if we had direct winter maintained bicycle networks that connected these areas, but for now this is how we make do. Trips are planned and timed to fit the needs of our daughter. For lengthier trips, we bicycle without our daughter or consider transit, car-share and/or borrowing a vehicle, but these other options require a little more planning. The key is to be flexible. Outside of route challenges, there are also the normal baby/toddler struggles that can make things tough. These are not exclusive to riding a bicycle, but the bicycle does introduce some unique obstacles. The most difficult of course is the “I don’t want to get in the bicycle” meltdown. Many parents who transport children by car experience this as well, but it can be very tough when it happens while loading a bicycle in the middle of winter. One’s patience will definitely be tested in these moments, but providing room for flexibility and planning trips to coincide with naps and feeding can be a huge help. There have been trips where we had to strap our daughter to our chest and walk our bikes home because that is simply what she wanted to do. Otherwise, there is the normal child-care planning that requires packing of snacks, diapers, changes of clothes, toys, etc. and all of this can reduce bicycle mobility without the proper preparation. Our cargo bicycle definitely helps by providing ample room for storage. Patience, flexibility, planning and proximity are key to embracing the bicycle as a central transportation choice when traveling with little ones in winter. North America has been a little slow on the cargo bike uptake, so for practical bicycle design we turned to Maayke’s Dutch heritage where cargo bikes have been around for decades. We chose a Dutch bakfiets (box bike or cargo bike) because it provides a cargo/child transport area. This bicycle has truly been a lifesaver, especially in the winter. Our daughter sits in the front cargo box. On cold or snowy days she has the option of being sheltered with a transparent cover, and there is still room to carry groceries. This bicycle also supports baby car seat installation, so it allowed us to travel with our daughter from a very young age. For winter riding we add studded tires. We honestly don’t think we could have managed winters with a young child without this amazing bicycle. We are currently expecting another child so we will soon experience the new challenge of adapting this bicycle to support two children with cargo. We’re looking forward to it! Michael Napiorkowski and Maayke Schurer are the co-founders of the Ottawa Bicycle Lanes Project.